The folks behind Skulls of the Shogun have a lot of regrets about their publishing deal with Microsoft. 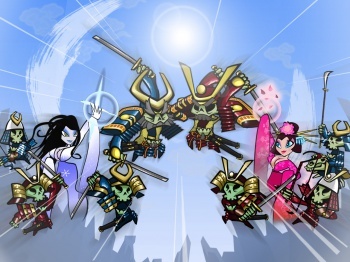 The developer behind Skulls of the Shogun, a comic turn-based strategy game where you fight to become the Shogun of the Dead, knew it was making what Borut Pfeifer of Plush Apocalypse Productions describes as "a deal with the devil" when it signed a publishing agreement with Microsoft. At the time it seemed like a good idea; the Surface tablet was about to take the world by storm, and Xbox Live was a very tempting marketplace. Agreeing to be exclusive to Windows 8 seemed a small price to pay. Except the Surface didn't take anything, whether by storm or drizzle, Xbox Live wasn't as good a home for the game as the developer had hoped, and the backlash against Windows 8 was much more aggressive than anticipated. "It was a case where we were like 'we know some things are going to be a problem but we think that on some level we'll get something out of them as well'," says Pfeifer. "I think it was an awful lot worse for us than others. We ran into problems that nobody else had got or talked about." But Pfeifer thinks calling Microsoft, or its publishing arm Microsoft Studios, evil is an undeserved compliment. "To be evil, you have to have vision, you have to have communication, execution," he says. "None of those are traits are things that I would ascribe to Microsoft Studios." Releasing the game on three different platforms caused endless headaches, not least because the three platforms weren't really compatible with each other; a fix for one caused issues with another. Adding to the pain, Microsoft didn't pay on time, forcing the developer to take out a loan to cover expenses. This Pfeifer attributes in no small part to the "systemic problems" he encountered at "institutionally incompetent" Microsoft Studios. Pfeifer feels that Microsoft's indifference, rather than any positive action on its part, is what will kill off the indie scene on Xbox. "I personally would like to go back in time and kick myself in the balls," says Pfeifer. "I'd just like to have that year and a half of my life back." But there is some hope. Skulls of the Shogun: Bone-a-Fide Edition is headed for Steam, with new content and Tanuki Monk. With any luck, things will turn around for Skulls of the Shogun, now that its definitive edition is in beta release. It's going on full sale in July, but preorders can be had over here, at $11.99 a pop.